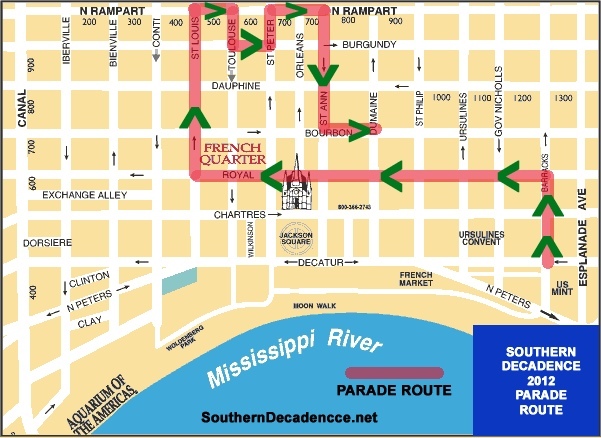 Decadence is more than 40 years old, and my understanding is that it started with a group of friends that held a party in the lower Quarter and it morphed to the bars, as most parties held in the Quarter do. Now, it’s a huge economic boost to the city and as much support and thanks as other event organizers get for returning to the city post Katrina, the gay community that has always spent millions visiting our city deserve thanks too! After all, many of these visitors were stuck in town in the aftermath of Katrina, and so many of the gay Quarter businesses stayed open and serving during and others reopened quickly after. With a 70 plus year old mother living across the street from one of the wilder gay bars, I can tell you that it’s possible to live quietly and yet with some needed joi de vivre because of this community being here. So, get to the Quarter on September 2 and watch a great time being had and have a little yourself…. This entry was posted in French Quarter, French Quarter gay community, History, holidays and tagged 2012, Bourbon Street, Labor Day, Southern Decadence.